7th Chilliwack Brownies Back Row (L to R): Naomi B. (Blue Moon), Karla R. (Brooke), Taegan F. (Grandma Ella), Nyah T. (Cindy), Hannah P. (apple tree), Bridgette P. (Wise Old Owl), Naleigha M. (Pear Tree). Front Row: Danaeya C. (Leo the Turtle), Kiera M.(Scooter the Dog), and Anya H. (Goldilocks the fish). The 7th Chilliwack Brownie Unit has been working on the Hear Our Voice Challenge and the girls have voted to share their favorite picture of the year. 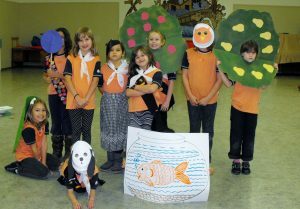 In the fall they performed a dramatic interpretation of The Brownie Story at their enrolment ceremony. The girls chose their parts the week before and then the night of the enrolment they donned costumes and had a good time entertaining the visiting parents. Drama is very important in our unit, with skits or charades being done most meetings.